Find the humor in things and laugh a little everyday. willing to share in order to bring awareness to Mental Illness – and I am grateful. I grew up getting to know the term ‘mental illness’ and what it entails. When I was younger, I learned that it isn’t just sadness, anger, or an extreme of any one feeling. To me, mental illness is like any other illness, a selfish thief who robs people of life’s opportunities, often more than once, and can even decide to stay indefinitely. My uncle suffered from an impulse control disorder and chronic depression. My dad suffered through bipolar disorder and heavily self-medicated through alcohol abuse. When I was in high school, I quickly learned that my best friend, my own sister, too, had been silently suffering from bipolar disorder. Mental illness is not easy to write about, especially when it involves the people you care most about. It isn’t easy to write about because mental illness can be violent, even when it is silent. Because of this, it has the ability to destroy relationships between those who cannot convey and those who cannot understand. I struggled for years trying to understand and forgive the verbal, physical, and emotional hurt my loved ones with mental illness, namely bipolar disorder, inflicted around me. I came to truly hate them before I realized it was not them who I hated, but their mental illness. I’ve watched my sister struggle through cyclical months of severe depression and mania, constantly battling anxiety. I tried, but I could never truly resonate the everyday fight it takes (on top of hurdling over life’s random obstacles) to conquer life. Personally, it wasn’t until my sophomore year of college when I developed acute and then chronic post-traumatic stress disorder, severe depression, and anxiety as a result of a sexual assault. There were days where I felt brave to get out of bed, to eat, shower, go outside – whatever it took to be or feel human. I felt like an ashamed, lazy, misunderstood, frustrated, and unable ghost. This is what mental illness does to people and it’s very real. Suddenly, I intimately understood my sister’s anxiety, my dad’s anger, my uncle’s depression. Although I feel that mental illness has joined the social conversation more than not in my generation, it still carries a stigma. This stigma is in part due to the difficulty of obtaining tangible evidence and in part due to the silence of mental illness. Mental illness marginalizes its victims and medical health is not effective for the reasons prior stated. This is particularly true for college students who face the pressures of competitive academics and ‘10-year plan’ trajectories. My generation was built for the fast-track; but, many of us are silently suffering from mental illness, like depression and anxiety, out of fear of failing to keep up. For those who have experienced, are struggling with, or unfortunately may encounter mental illness, I take my advice from my older sister who always reminds me “to be patient with yourself”. Mental illness can be unforgiving; but, there is control in knowing you can forgive yourself every time and start again. Yes, my family has been affected by mental illness and I am writing about it today. My brother suffered from paranoid schizophrenia before passing away in 1995. This is a difficult topic to write about because it is emotional, complex and complicated. I will try to describe Raymond’s story with the detail and respect he deserves. Raymond and I shared an apartment about the same time the disease began to take hold. In other words, his paranoid episodes were becoming frequent and more intense. I would hear him talking to himself in his room, and at times I’d hear him become agitated and angry. On a few occasions, I became annoyed and impatient with him which usually resulted in us yelling at each other and me leaving the apartment. Although these times were frightening to me, I never feared him because I knew in my heart he wouldn’t hurt me. These episodes caused me to be anxious as they didn’t make sense nor was I able to control them. Can you imagine the fear he felt? Months later, my parents urged him to move in with them. My mother had a special bond with Raymond. Perhaps she felt his pain as only a mother could. The next paragraph, written by my sister, describes the turning point that ultimately brought him the help he needed. The most difficult time I remember was when Raymond was left home alone while the rest of the family went to my sister’s house for Easter. When we returned home later that evening, my father told us the neighbors had called the police because they felt Raymond’s behavior that afternoon was troubling to the children who lived in the apartment complex. The neighbors knew him and told the police he was not a danger but was mentally unstable. The police initially brought him to the station, then transferred him to a facility in Downey, California, for a 5150 psychiatric hold. I wanted to be with my brother. When I tried to gather all his necessary belongings, I came across a notebook he kept in his dresser. I was not able to contain the emotions I was feeling when reading through his notes. The notes had many obscure writings and scribbles – I could see, feel and live through some of the pain he must have felt during his torturous mental anguish. He drew stick figures of him calling out for help wanting to escape. That was the first time I fully understood the suffering he endured. As painful as the series of events described above may have been, it was a blessing and an answer to our prayers because he was finally able to get professional help and medication for his schizophrenia. Raymond continued to experience small episodes of paranoia, and in 1989, after stabilizing somewhat, I asked him to be in my wedding – I was happy and proud to have him be a part of that special day. Mental illness is a disease that comes in many forms and crosses all boundaries. My brother was a beautiful, generous and kind person. He did not choose this disease and I will not allow his memory to be defined by it. Last, but not least, part three of my interview by Bonjour Events for Dinner Party tips. We asked Cindy Zuccarino of Ciao Tavola how she tastefully carries out a dinner party theme for her clients. Below is a great excerpt from her interview. Theme dinners are fun. It is important however, to keep the decorations tasteful. You don’t want your guests to think they are at the local amusement park or at your child’s birthday party. Once I hosted a fundraiser dinner – the theme was “A Trip to Italy”. The handmade invitations (your guests will appreciate the creativity and effort) were written in Italian, thanks to my Italian mother-in-law. I also included an English translation. Upon arrival, my guests were treated to Prosecco and Italian-style appetizers. After 45 minutes, I summoned them to the family room where I had an opera singer waiting to serenade them for the next 45 minutes. The singer was a complete surprise! Dinner was served on my Deruta place settings…all the while, opera CD’s were playing softly in the background. We finished the evening on the terrace enjoying my homemade Tiramisu and coffee. Your dinner party can be whatever you make of it; it just depends on how much energy you invest. Remember…the idea is to have fun! Part two of my interview with Bonjour Events for Dinner Party tips. Part three, coming soon. With the entertaining season around the corner we asked Cindy Zuccarino of Ciao Tavola for a crash course on creating a beautiful dinner table. Known for her elegant, yet relaxed dinner parties, friends began asking Cindy for help planning dinners in their homes and thus launched her business Ciao Tavola, helping bay area hostesses create unique dinner parties. Below are her top five tips for creating an attractive dinner table. 1) A must for a beautiful table is unscented candles. Try to use different sizes and heights using odd number quantities. Dim the overhead lights – you want to see what’s on your plate, not your neighbor’s facial blemishes. 2) Fresh flowers, without a doubt will soften any table…keep strong scented flowers to a minimum. Using greenery such as branches, bay leaves or pine (watch the sap!) or vines gives the table a cozy, rustic look. 3) Name cards are a good idea. Be creative! If you are giving parting gifts, tie a name card around them and place on top of the plates. You can also use a photo (small, of course) of each guest in a frame and place at each seat – the frame can be the parting gift, too. 4) I like to remember to use the rule “less is more” and give your guests personal space at the table. 5) Try to stick to three colors; one dominant and two complimentary. Thank you Cindy. Watch for a few more tips from Cindy this week. In 2008, I was interviewed by Bonjour Events for Dinner Party tips. Here is part one. Two and three, coming soon. Prepping for a dinner party is never an easy task. We asked dinner hostess Cindy Zuccarino of Ciao Tavola: What are five things every hostess can do to feel more prepared for her next dinner party? * When creating your guest list, consider who you are inviting…make sure there are not underlying problems. If you know there will be a couple/people who do not know the other guests, think ahead for a common thread. It is up to the hostess to make sure everyone feels included. * Try to come up with a general menu at least a week ahead of time. * Learn from your mistakes! If something did not work before (food, people, conversation), do not do it again. * Create a general “to do” list. Try to think of everything, especially things that don’t have to do with the food like reserving the babysitter, taking the dogs to the kennel, etc. * Make a mental note of a rough time-table for the evening…how long will cocktails take, at what time should the guests be seated, etc. And most importantly, be flexible, relax, and always have a good sense of humor! 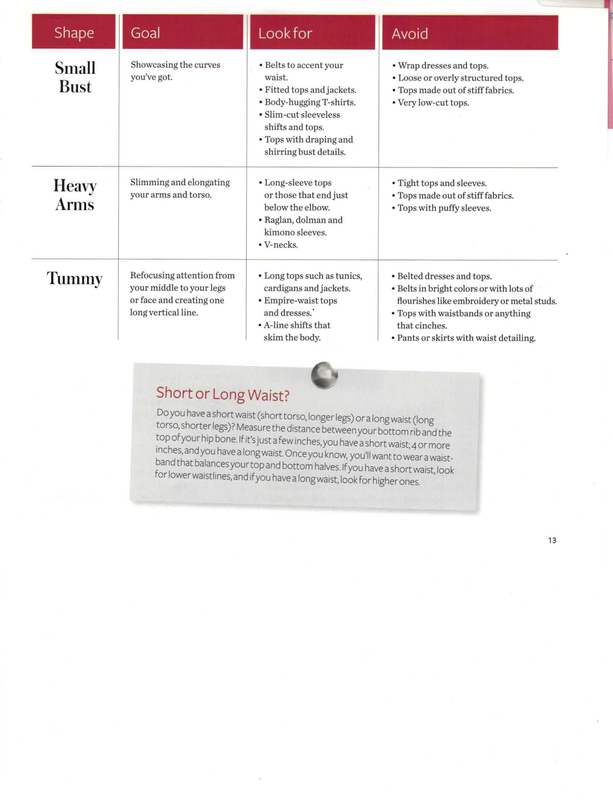 Know and embrace your body’s shape and you will save a considerable amount of time and money on clothes. Now ladies, I’m talking about the body you’re schlepping around now – not the one you occupied 20 years ago. Your body is beautiful, regardless of what stage of life you may find yourself…at least, that’s what I say when I exit the shower. It works – or could it be because I haven’t yet put in my contacts? Believe me, I have morphed over time, too. My late teens to 30, I was lucky enough to have a nice figure. Then came the kids. Don’t get me wrong – I was happy and blessed to have birthed 2 healthy babes, but what the heck happened to my innards? Gravity was not my friend. I couldn’t put things back into place, no matter how many Zumba, yoga, Pilates class memberships I bought (notice I wrote “memberships I bought” and not classes I attended?). I was guilty of making shopping errors. There are clothes hanging in my closet with the tags still on them. My “education” began years ago when I started working as a wardrobe consultant. The classes and training opened my eyes to a whole new way of seeing how clothes should fit. Also, being in a studio with a bunch of women hell-bent on dressing well is a learning experience on its own. Now I’m confident and relaxed when I shop. I am also less critical of myself. Gone are the days when I would try to squeeze into something that was not complimentary to my figure. No matter how hard I try to channel my inner Sofia Vergara, reality and dressing room mirrors will smack me back to my true self. Keep things in perspective, too – when you see that an outfit looks good on the 18 year old sales girl, that doesn’t necessarily mean it will look good on you. 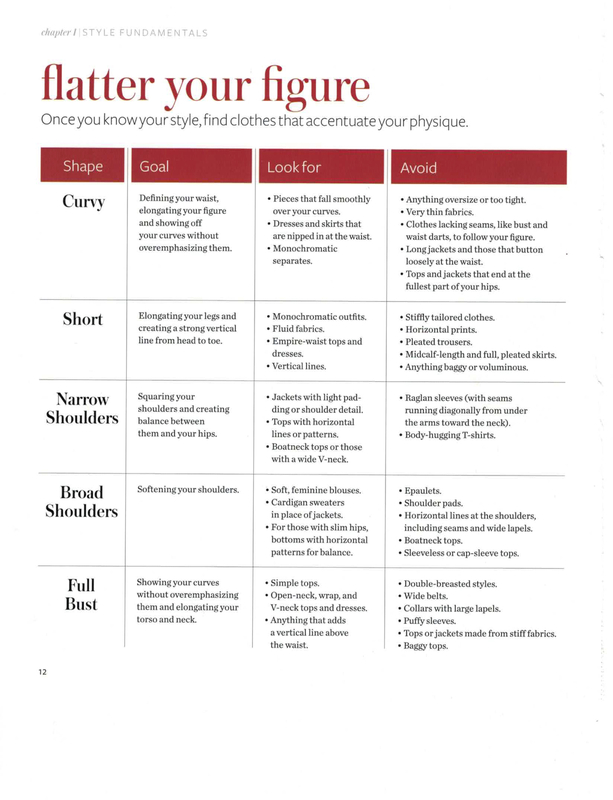 Take a look at the chart and find which category best describes your figure and become familiar with the types of clothes that will compliment your silhouette. Me? I’m short, full bust and short-waisted. How about you? When you look mahvelous, you feel mahvelous! 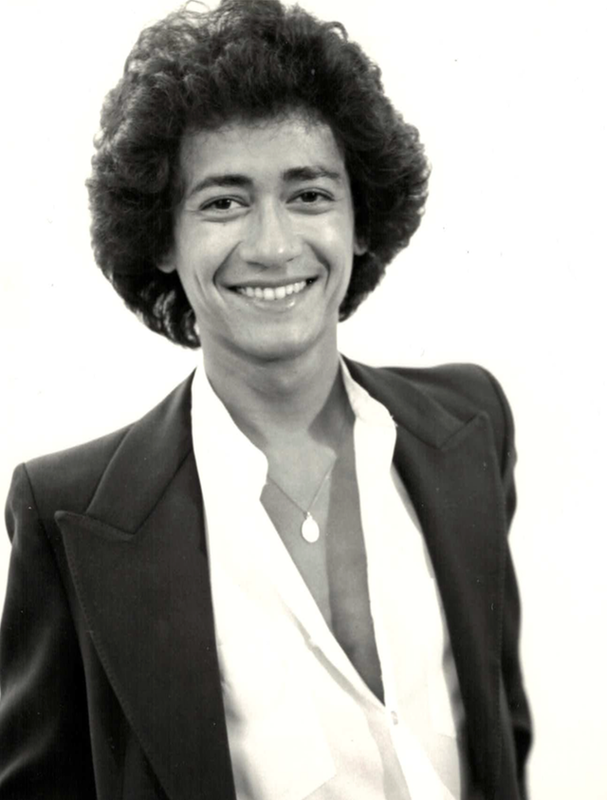 On Monday, February 20, 1995, Raymond passed away. One week shy of his 40th birthday. I don’t remember exactly when he was diagnosed with AIDS nor how the disease consumed his body, but I do remember the exceptional person he was. And that is what this post is about, memories of my brother. I decided to write about Raymond because I realized today marks 20 years since his passing. Raymond was beautiful inside and out and perhaps the most generous person I have known. He was gentle and kind – not once, did I hear him speak ill of anyone. And since he was part of my large; and at times, rambunctious family, he had a sense of humor as well. Evidently, he was also patient because he didn’t mind hanging out with me. We would often cruise to Redondo Beach. First in his VW Bug then later in his red convertible MG Spider. When I was in 8th grade, he took my friend and me for one of these drives. We came upon a hitch-hiker on the way. My friend and I dared Raymond to pick him up…and lo and behold, he did! The poor bloke had to sit in the backseat with my friend. He was probably more afraid of us than we were of him because we bombarded him with questions, “who are you, where are you from, where are you going…and why the heck would you accept rides from strangers?”. Anyway, I learned a lesson. Don’t dare Raymond. Another memory I have is when Raymond tried to convince my mother into letting me go to the senior prom. I was a sophomore and a senior boy had asked me to be his date. My mother was very strict and boys were definitely out of the question – especially one who was two years older! But Raymond told me he would try because he wanted me to go and the boy was a real “looker”. Raymond sent me to my room so he could talk with my mom – there he was, sitting with her at the dining room table, explaining how the prom was a fun tradition in high school, etc. It was a valiant effort. But the answer was still NO. sigh. My parents were not the type of parents who would sit down and have open conversations about random things. But even though my mother didn’t talk much, friends always felt welcome in our house. I remember Raymond’s gay and lesbian friends coming over and boy, they came in all shapes, sizes, and personalities! Didn’t matter though – my mother welcomed them like she welcomed all our friends. No special treatment. Everyone was the same. I know Raymond appreciated this. He and my mother had a special bond. The time came when Raymond became too ill so he had to move to the Serra Project Home in Long Beach, a hospice for AIDS patients. The disease may have taken his physical beauty but he remained positive and caring. When we would visit him, he would ask how we were and what was new – never complaining about his problems, pains or burden. My family made a conscious effort, although unspoken, to be with him everyday, even for a little bit. However, that Sunday, for some reason, no one was able to visit. He died early the next morning – I believe in my heart that him being alone was actually a good thing because it allowed him to finally be selfish and let go. You see, Raymond was the kind of person to hold on to life as long as possible to spare us the grief. He died with dignity. Sadly, Raymond also suffered from mental illness – paranoid schizophrenia, to be exact. I’ll save this for another post as it deserves more than a few lines. His body and mind are now healed and he resides in the mansion God has prepared for him (John 14:2). I think about him often and I feel blessed and proud to have called him my brother. His picture makes me smile.